Property en-bloc sales have been picking up pace over the last few weeks, and so far, there are already eight en-bloc sites offered for sale since January. Still, analysts say they are not too upbeat on the prospects of collective sales as demand for such sites remain soft. Minister for National Development Khaw Boon Wan said in his blog last month that collective sales of private properties are receding. This could be a sign of a more stable property market. Yet, the emerging trend seemed to suggest a different story. There have been eight en-bloc launches so far this year, including five sites offered just last week. That is almost half the number of en-bloc sites offered for sale in the first quarter of last year. Last year, there were 18 sites put up for collective sale in the first three months of 2011. Analysts say the sudden surge is because sellers are rushing to sell off their properties on expectations that market sentiment could get worse later this year. This came after the government introduced more cooling measures such as the Additional Buyer's Stamp Duty last year. The uncertain economic outlook is another factor that may dampen buyers' sentiment, going forward. Credo Real Estate managing director Karamjit Singh said: "More importantly, it's that they would need to complete the entire process of buying a site, building it and selling out all the units within five years from the time they enter the contract with the sellers. "For small en blocs, that's manageable, but for medium to maybe large en blocs onwards, it's a very tall order." Analysts say pricing of en-bloc sites is key to ensuring a successful deal. They added that sellers cannot expect huge premiums for their properties amid current market conditions. International Property Advisor CEO Ku Swee Yong said: "Fewer developers will be keen because if the market trend were downwards, they would be waiting for en-bloc sellers to reduce their asking prices as well, so if the market were to trend down, in fact, we could probably see very few en-bloc transactions today in this year." The lower pricing has prompted analysts to expect the total value of en-bloc deals to decline this year to around $2 billion. That is lower compared to the $3 billion worth of en bloc deals clinched last year. It is a far cry from the $11 billion to $12 billion worth of en-bloc deals recorded in 2007, which is the height of the property market boom. Analysts added with the higher risks attached to en-bloc deals, developers may go for government land sales instead. This helps ensure a faster turnaround for developers and more financing support from banks. So are collective sales really back in favour, or is it a case of what the Chinese termed as "Hui Guang Fan Zhao" (i.e. the last few moments where a terminally ill person suddenly seemed in the pink of health, just before his death)...? 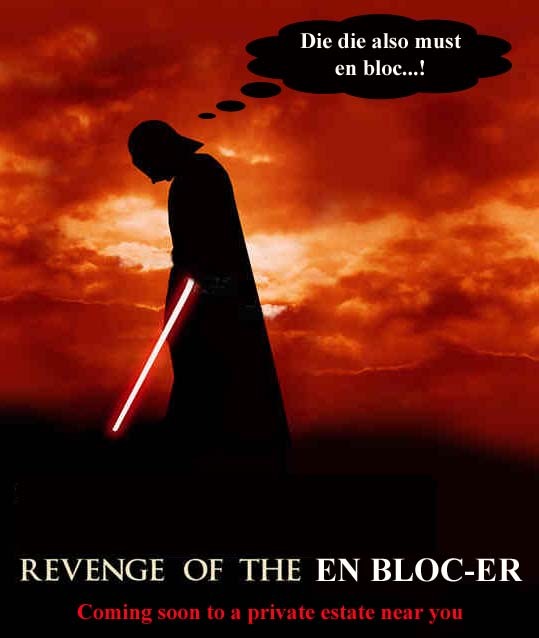 No Comment to " Revenge of the "En bloc-er"..? "